There is much to do to help yourself when you are suffering from adrenal fatigue. Lifestyle changes, relaxation, nutrition and positive thinking all play an important role. 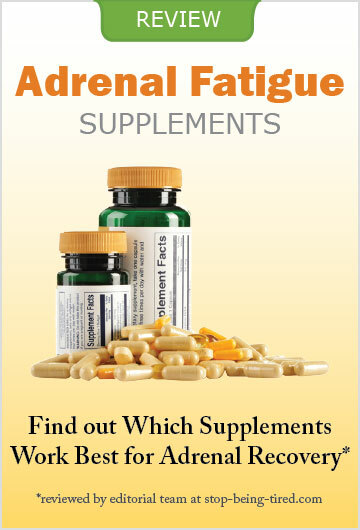 Adrenal fatigue is caused by unrelieved, long-term stress. Because it can take many years of stressful living to bring about this condition, it is understandable that it might take some considerable length of time to recover from it. The path to recovery, however, can be made much easier by self-help measures which will improve both your condition and your quality of life. We are resistant to change, imagining that the new state will be worse than the present one, and finding all sorts of reasons not to change. But in the case of adrenal fatigue and chronic exhaustion, change is a necessity. Getting better has to be a priority and you may have to re-arrange your life around the need to put yourself and your health first. For many of us, this is a new thing, because we are used to putting the perceived needs of other people ahead of our own. Since adrenal fatigue has most likely been caused by stress, reducing stress must be a priority. Are you working too hard, or too many hours? In times of economic pressure, many of us are apt to do so. Is it possible for you to downsize, reduce your outgoings, work fewer hours and give yourself more time to rest and relax? Downsizing has many benefits for your health and will help you regain your energy. Taking at least one and preferably two days off a week in order to relax and have fun. Negotiating a more flexible contract at work, if possible. Moving to a smaller house, or renting. Making more time for family life, or enjoyable activities with friends. Sharing a car with a family member or friend. Watching television less and reading/meditating/talking to loved ones more. Making sure that you include daily exercise and relaxation as part of your lifestyle. Taking up an activity which you had always dreamed of doing e.g. canoeing, learning a language, painting, etc. The key to successful lifestyle change is that each and every change must reduce stress and add to quality of life. As well as giving up stressful activities, you need to consider taking up supportive activities in your life. This includes recreation, relaxation and rest. Recreation is something that many people with adrenal exhaustion have neglected. It is essential as it literally re-creates us. Some activities you may like to do alone, but some should definitely involve other people. Having fun to many stressed people may sound like a luxury, but actually it is a priority. Having plenty of rest is essential, but you will find it even more effective if it is structured and part of your daily routine. In the early days of recovery, you may like to make yourself a schedule with rest periods written in throughout the day. Making meal plans is essential in recovery from adrenal fatigue. Not only will you be able to get the best nutrition, but you will avoid getting overly hungry and making a poor food choices. [Please seeFood and drink to avoid if you are feeling tiredfor food that you should try not to eat.] This includes sugar, processed food, fast food, junk foods, caffeine and fizzy drinks. Try to plan three or four small meals a day with a focus on fresh food. Some of it should be raw. Simply cooked food, such as steamed or boiled is easier for the digestion that fried food. Get in the habit of carrying some healthy snacks such as nuts, chopped raw vegetables, or fruit to hand in case you get hungry. Many people with adrenal exhaustion go through depression as well. This is only to be expected as having low energy levels is depressing by itself. But things don’t have to stay that way. A positive mindset is one of the great aids to recovery. You will almost certainly have to work on this. Just like lack of physical fitness, many of us get mentally unfit as well. We have to retrain our thought patterns gently so that they align themselves positively rather than negatively. An excellent way of developing optimism is to keep a journal of all the pleasant things that happen to you in the day. As you start to focus on the positive, you will find that it occurs more and more. Some people like to recall five things that they are grateful for before they go to sleep at night. In conclusion, there is much to do to help yourself through the process of adrenal recovery. Various causes can trigger the development of adrenal fatigue. Find out which lifestyle habits and behaviors over time create the type of stress that can overload the adrenals.